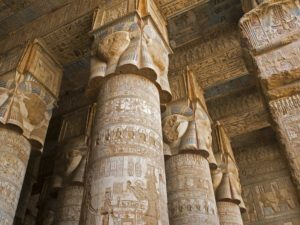 Dendera, the Greek name of the city of Tentirys, is a city made holy by the presence of three different sanctuaries, that of Ihly, the sistrum-playing son of Horus, that of Horus himself and that of Hathor. Today the first two have almost totally disappeared, all that remains of Ihy’s sanctuary being a monumental door. As far as the third sanctuary is concerned the temple is more or less intact and the numerous other ruins are sufficient to allow us to reconstruct the whole layout of this sacred place. It was dedicated to the goddess Hathor whose name (literally Hat-Hor) means <<Horo’s dwelling>>, and who is often depicted as a sacred cow or as a woman whose head is surmounted by a pair of horns. Built of granite, like most of the temples constructed during the Ptolemaic dynasty, the temple which we so admire today is only the reconstruction of a pre-existing and much older temple which probably went back to the time of Cheops and Pepi I. The temple consists of a splendid hypostyle hall, opening onto the square. It is 25 meters by 42.5 meters and 18 meters high with twenty-four hathoric columns, that is columns with a cubic capital bearing the face of the goddess. Inside the temple, there was a smaller temple called the <<chapel of Holiness>>, the most hidden and secret spot in the sanctuary. Here the mysteries of the birth of cosmic order from the primeval chaos were celebrated. However, Hathor as well as being a cosmic goddess was also the patron of dance and music. Thus every year at Dendera the popular feast of <<drunkenness>> was celebrated on the twentieth day of the first month of the flooding.